Elma and Madhu (Steve) in Duke Forest, North Carolina, 1960. In our globalized times, interracial marriages aren’t the gasp-inducing events that they were way back in the sixties. Information about other societies and cultures flows freely across national borders, while communication technologies keep us all in touch when we want, where we want. For millennials, it’s hard to believe that once, the world was a very different place. 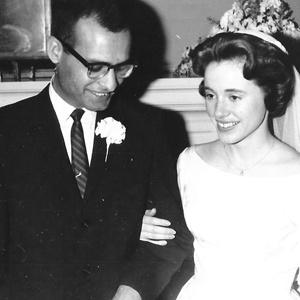 In 1960, when 18-year-old Elma Griscom, a Duke University freshman, agreed to a blind date with a young Indian student—Madhu Vaidya—little did she know how her life would change forever. Steve, as Madhu was known in America, was a likeable fellow and Elma’s relationship with him deepened into love. When Elma became pregnant, her family was shocked but quickly reconciled to her decision to marry Steve and live with him in India. In the following excerpts, Elma recounts her life with Steve, during their years in Himachal Pradesh, where Steve worked as a Forest Officer. Elma’s detailed memoirs bring alive her experiences as a young, impressionable girl parachuted into the complexities of life in a large, extended Indian family who, though affectionate, nevertheless constantly urged her to ‘fit’ into the traditional joint family milieu. India itself was a huge challenge for the pregnant young foreigner. All the clichés she’d heard of came alive, from the searing heat and dust of a Delhi summer to pesky beggars, questionable public hygiene, and dodgy infrastructure. Add to that a gaggle of well meaning but noisy relatives, lack of privacy and the patriarchal structure of society, and one would imagine a lesser person would throw in the towel. However, bouts of homesickness and frustration not-withstanding, the redoubtable Elma waded through it all, giving birthto three children, learning a new language, entering the teaching profession, obtaining Himachal University degrees, and later, setting up a small business. There were circumstances and events that were contrary to her American upbringing, values, and sensibilities. What were her emotions and struggles like? In this wonderfully frank yet sensitive account, Elma offers us an engaging, detailed perspective of life as an American bahu in traditional India, back in the sixties. Now settled back in the U.S., Elma hopes to publish these memoirs of her years in India as a book. Before I knew it, I was saying goodbye to my parents and younger sisters at the Detroit Metropolitan Airport. The anxiety about the trip to India hadn’t caught up with me yet. It wasn’t until Steve and I boarded the Air India Boeing 707 that I realized I had no idea when I would see my family again and what was ahead. What was life going to be like in Steve’s homeland? 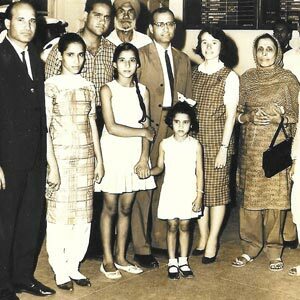 Elma arrives in India—being received by Madhu’s family at the New Delhi Airport. Inside the Delhi International Airport, the arrival room was crowded with people, and as we entered, a large group of Indian men, women, and children—at least thirty—surrounded us. Everybody was talking at once. Some family members put garlands of flowers and rupees around my neck. Others handed me bouquets of flowers. A part of me felt like a celebrity, but another part was overwhelmed. Will I fit in? Will I learn the language? Will I like this new life? At five o’clock in the evening at the Delhi home of a family friend, I woke up dripping wet with perspiration. I wanted to take a shower. Hansa, Steve’s sister, took me to an open courtyard at the back of the house and then led me into the shower room which was separate from the rest of the house. I saw a waist-high faucet and an empty bucket but no shower or bath tub. I felt silly asking her how to take a shower when there was no shower. I decided to go back to the bedroom and ask Steve about the bathroom. He laughed when he heard my questions and explained. “Fill the bucket full of water, dip the lota (small metal cup) into the water, pour water from the lota on yourself, soap yourself, and then pour more water while sitting on a small wooden stool.” I tried my first Indian shower. The next day Steve’s sister Vidya asked me to try on one of the new saris I’d bought during our shopping trip to Chandni Chowk in Old Delhi. I had difficulty draping the six yards of cloth by myself. When I finally got the sari fixed as well as I could, I looked at myself in the mirror and felt sloppy compared to the Indian women who wore their saris so effortlessly. I went into the living room to show my in-laws and expected them to laugh at me. Much to my surprise, I saw their look of approval rather than laughter. The third day of our stay in Delhi Steve told me that we were going to an Arya Samaj temple for a religious ceremony. I was told to wear my new maroon silk sari, an instruction I reluctantly complied with due to the overpowering heat and my protruding belly. We arrived at the temple, and family members led us into a large hall with at least forty friends and family sitting on the marble floor. Steve and I were guided to the center of the room where there was a wood fire tended by a man who, Steve told me, was a pandit. We were married six months back in Birmingham, Michigan, and now there was a second ceremony being performed? I began to think that Steve’s parents felt the first one didn’t count. When the ceremony was over, I was relieved but was also upset that I hadn’t been explicitly told that the ceremony was going to be our Indian wedding. On the ride back to the house I was quiet, but internally my emotions were in a turmoil. Three days in Delhi and I was suffocated by lack of privacy, overwhelmed by a strange language, surrounded by new people, and married a second time in six months. I felt the pressure of family members trying to get me to look and act Indian. I sensed that they were trying their best to make me feel comfortable and accepted, but our different languages, customs, and lifestyles were stumbling blocks. I had much to learn in order to make the transition from life in the United States to life in India. I realized my journey was going to take time with life-changing challenges along the way. So many things were bothering me. Would life in India get better? I hoped so. Usually I’m a pretty positive person. I did love the beautiful mountain views from the town of Shimla where we were staying so Steve could apply for a job in the forestry department. At 7,000 feet above sea level, the cool climate was heaven after the Delhi heat that I had to contend with in my first four days in India. However, at times I longed for America. I was learning more Hindi but could only follow a few simple conversations. I still couldn’t eat much of the Indian food and hungered for my favorite American dishes like cheesecake, spaghetti and meatballs, steak, and mashed potatoes. I was shocked by his reprimands. It was only ten-thirty, and both Steve and I were out together. As a high school teenager in Michigan in the late 1950s, I had more freedom than I did in India as a twenty-year-old, married woman. Steve apologized for being late, and we quickly went into our bedroom. It was two months since I arrived in India, and I kept wondering when Steve would get his job. We were living in a sister-in-law’s overcrowded, two-bedroom flat. If Steve didn’t get the job soon, I wanted to go back to America. I couldn’t keep living with family members. I yearned for my own space. 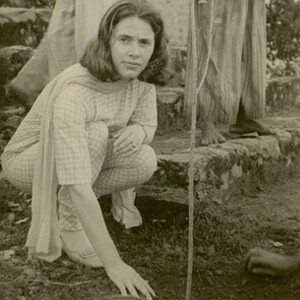 Elma at a tree-planting ceremony in Himachal Pradesh. During my first months in Shimla, I made several visits on foot to the maternity clinic for women who plan to deliver at the Snowdon Government Hospital. The staff was knowledgeable and friendly. I got more attention here than I did at my Durham, North Carolina doctor appointments. Most of the staff spoke English which was reassuring since I hardly understood Hindi. Early morning (August 19, 1962), I woke Steve up and told him I was having stomach pains which turned out to be labor pains. A jeep station wagon was sent for. As soon as it arrived, several family members crowded into the jeep with Madhu and me. The twentyfive minute ride to the hospital seemed like forever with my pains getting more intense as we traveled the forested, hilly, back road that wound up to the hospital on the Sanjauli side of Shimla. From the delivery room, I was taken on a stretcher to a spacious private room. When I asked for Madhu, the nurse said, “It’s another half hour before visiting hours start, and then he can come to the room but only during visiting hours. The hospital is very strict about honoring women’s privacy.” I was upset by this rule. Finally, Steve walked into the room with my father-in-law Babu-ji. I wished Steve would come closer and give our baby and me a kiss, but I knew that Indian culture frowned upon males and females kissing in public, not even married couples. While we were talking, the lady doctor who delivered our baby, several white uniformed staff members, and an authoritative male figure entered the room. My doctor introduced us to the head doctor in charge of the hospital. We conversed comfortably in English. Steve and I brought up our request for him to stay in the hospital room throughout the day and night. We argued that Madhu would stay inside our room so no one would be inconvenienced. Finally, the head doctor agreed to let Madhu stay throughout the day with me, but he wasn’t allowed to spend the night. I realized that this was the best arrangement that we were going to get. This meant that Ama-ji would be my attendant. After three years in India, Madhu and I decided it was time for me to visit my parents, and he would follow after four months. I was six months pregnant when I arrived at my parents’ home in Birmingham, Michigan. The reunion was one of mixed feelings. We were happy to be together, but it was hard for me to be returning alone. I was meeting them seven months after the death of son Raju, their first grandchild whom they had only seen in pictures. Shortly after my arrival in Birmingham, I started working at temporary jobs to pay for my >> Feature Elma with some of her students at the Bhartiya Public School. hospital expenses and worked up until my delivery. When the labor pains started, Mrs. Eddy, our neighbor, rushed me to the Royal Oak, Michigan hospital in her car. Hours later, I was overcome with joy, looking at my 7 lb. 13 oz. daughter. Madhu joined us in Birmingham two months later. Taking care of a baby in America was different than in India where my mother-in-law took charge and raised our son in her own way. Here my parents and sister were there to help as needed, but I was in charge. When asked, they made suggestions, otherwise I bathed, fed, and took Tara to her doctor visits on my own. When Tara turned five months old the three of us returned to India. Soon after, Madhu was transferred from Rohru to Kulu which was a much bigger town. Our Kulu posting was a better place for me than Rohru. I had a large circle of friends, and many of the women spoke English. From the time I was young, I loved teaching. While living in India, I had my first offer to follow this passion when Madhu was transferred to Chamba, Himachal Pradesh in 1971. A year later, I joined Bharatiya Public School when Rita, our youngest daughter born in Kulu, was admitted to the nursery section. Thirty-five years later and living in America, I have reconnected with some of my Bharatiya Public School students through Facebook and phone calls. They are living in the United States, Canada, Australia, and India. One of the students, a successful career woman, visited me at my home, and we reminisced about our memorable school experiences. She still called me, “Ma’am,” as she did when she was my third standard (grade) student. My best friend in India confided in me, “My worst fear is that my son in the United States will marry an American.” This comment, which was in Hindi, is part of a vivid memory from a social occasion with Indian friends. I listened attentively to their discussions in Hindi. Having lived eighteen years in India, I understood and spoke the language. 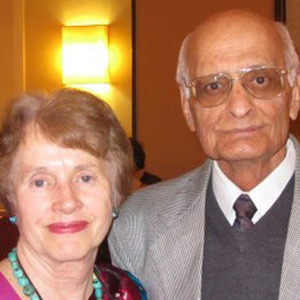 Elma and Madhu at their 50th anniversary celebration, 2012. A close friend said, “Aap Hindustani hain.” (You are an Indian.) I took this to mean that she felt I was fully adjusted to Indian culture, and that I was one of them. She was indirectly complimenting me on my biculturalism. I guessed from this discussion that my friends felt I had made a successful transition from the American way of life to the Indian way of life. After eighteen years of living in India I felt comfortable with Hindi, relished Indian food, wore Indian clothes, socialized with Indians, ran a small carpet business, studied at Himachal colleges, accompanied my husband on forestry tours, worked as a teacher, and had raised two daughters.